Senate President, Dr. Abubakar Bukola Saraki led the Principal Officers into the chambers; took the official prayers; and began the day’s proceedings at 11:02am. Senator Adamu Aliero moved for the approval of votes and proceedings of Tuesday, 6th November 2018. Senator Duro Faseyi seconded. Senator Andy Uba raised a petition on behalf of a constituency member against the Federal Mortgage Bank. Senate President, Dr. Abubakar Bukola Saraki referred the petition to the Committee on Ethics and Privileges to report back in two weeks. Senator Enyinnaya Abaribe cited Orders 42 & 52 and brought the attention of the Senate to the investigations of the Nigerian Police which ruled the alleged attempted assassination of DSP, Ike Ekweremadu, as a mere burglary. “I would like this Senate to not just dismiss this matter, but to ask for a thorough investigation into this case. The police has continuously dismissed matters like this. This should not be taken lightly.” - Senator Enyinnaya Abaribe. “I want to thank you all for your concern in this matter. No thorough investigations were made by the police. I was shocked to hear that they had said it was a mere burglary case. My son, who was hospitalized, was not even interviewed by the police.”-DSP, Ike Ekweremadu. “The police looked at the CCTV footage but could not figure it out. Fortunately, a technician came and was able to figure out the footage. Unless they withdraw their report, I will release the video to Nigerians to judge for themselves.”-DSP, Ike Ekweremadu. “The Nigerian Police conducted a very myopic and porous investigation to a case as serious as this. This is unacceptable and it is not normal. We are here to speak for the people, every Nigerian should feel safe and secure in their environment.”- Senator Dino Melaye. “Let’s be conscious of the importance of the right to life & take this very seriously, not just because it happened to one of us here, but because the life of every Nigerian is at stake. 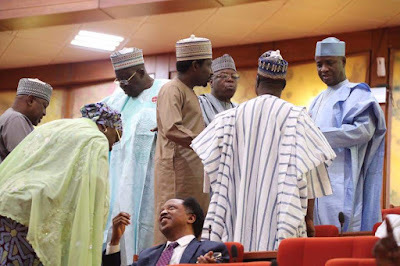 For this to be dismissed as a mere burglary shows that there is a cover-up somewhere.” - Senator Shehu Sani. I. Urge security agencies to thoroughly investigate the attempted assassination of the Deputy Senate President. II. Fast-track and ensure the quick passage of the Police Reform Bill. Senator Biodun Olujimi cited Orders 42 & 52 and brought an urgent matter of the politicisation of the Social Intervention Fund. “The funds have been used for political reasons. I have one of such forms where your BVN number, PVC number, gender and account details must be written. I urge that an Ad-hoc Committee be set up to look into this issue.”- Senator Biodun Olujimi. I. Set up an Ad-Hoc Committee to investigate the matter. II. The Ad-Hoc Committee should also investigate the implementation of SURE-P. Senator Barau Jibrin cited Orders 42 & 52 and brought to the attention of the Senate to the strike action embarked upon by ASUU. “Nigeria has been dealing with strike after strike. The issues raised by ASUU are genuine. It is to the best interest of education in Nigeria. I demand and call on the Federal Government to concede to the demands of ASUU.”- Senator Shehu Sani. “It is important that the government lives up to its reponsibilities. We intervened in the last ASUU strike and promised that their conditions would be looked into but the agreement has not been kept. We should look into this and ensure that agreements reached are implemented.”- Senator Mao Ohuabunwa. Urge the Federal Ministry of Education and its labour employment counterparts to urgently resolve any issues bordering on and in contention with the ASUU strike. “It is only in Abuja that one can find pipe-borne water. It’s a disgrace to Nigeria. We’ve gone 1 step forward & 10 steps back. We should be providing pipe-born water to every household in Nigeria. An investigation should be made by the Committee on water to find out what the funds for this purpose have been used for” - Senator Enyinnaya Abaribe. “It is true that there is a serious decline in water supply in rural areas. Funds were released but have not been utilized. It is a shame that we do not have pipe-borne water. I support this motion.” - Senator Adamu Aliero. “I would like to draw our attention to a recent incident in Abuja which was due to the digging of boreholes. I suggest that this chamber looks into the matter.”- Senator Emmanuel Bwacha. I. Direct the Committee on water supply to carry out a holistic investigation into the declining state of water in Nigeria. III. Urge the Federal Government to investigate closely the implementation gaps in water services, delivery capabilities in the water sector and promoting better integration of the private sector in the water sector. Senator Suleiman Hunkuyi cited Order 42 and 52 and called the attention of the Senate to the multiple killings that engulfed Kaduna State and its environs within the past 2 weeks, which led to the loss of the life of the Chief of Adara. “This is a very sad issue but I was extremely impressed by the proactive steps taken by the Government of Kaduna State.” Senator Abubakar Kyari. 1. Report of the Committee on Ethics, Privileges and Public Petitions in respect of a petition from Mr. Ominiaboh’s Odiri Austin against the Nigerian National Petroleum Corporation (NNPC) for alleged wrongful dismissal from the service of the corporation by Senator Sam Anyanwu. Senator Binta Masi Garba seconded that the Senate do receive the report of the Committee on Ethics, Privileges and Public Petitions in respect of a petition from Mr. Ominiaboh’s Odiri Austin against the NNPC for alleged wrongful dismissal from the service of the corporation. 2. Report of the Committee on Tertiary Institutions and TETFUND on the Federal Polytechnic Langtang, Plateau State (Est, etc) Bill, 2018 (SB. 627) by Senator Barau Jibrin. 1. Demise of Chief Dr. Tony Okhakon Anenih CFR: The Iyasele (Prime Minister) of the Esan People by Senator Clifford A. Ordia. “I am one of those that benefited from late Chief Anenih. We are here to mourn a great man. May his soul Rest In Peace.”- Senator Binta Masi Garba. “For once, I met a leader who treated people as human beings. He would face issues and say them as they were. He was not egocentric. We lost our ‘Mr. Fix It’, we lost a great man.”- Senator Biodun Olujimi. IV. Urge the Federal Government to name the National Institute of Construction Technology and Management, Uromi after late Chief Tony Anenih CFR. 2. The growing crises in the National Health Insurance Scheme (NHIS) and the National Primary Health Care Development Agency (NPHCDA) by Senator Mao A. Ohuabunwa. Direct the Joint Senate Committee on Primary Health Care and Communicable Diseases and the Health Committee to wade into the emerging crisis of confidence and corruption in NPHCDA and NHIS, so as to thoroughly investigate the matter and other infractions and inform the Senate of the findings within two weeks. 3. Rescission and Reconsideration of the Senate Approval of Virement/Supplementary Budget for Independent National Electoral Commission and Security Agencies for the conduct of the 2019 general elections by Senator Danjuma Goje. II. Approve the sum of N242,245,050,100 only. III. Approve the source of fund from Ministries, Departments and Agencies (MDAs) and the Service Wide Votes. IV. Committee on Police should look into the way the Nigerian Police have used the funds from the last two elections and report back in two weeks. Senate President, Dr. Abubakar Bukola Saraki announced Senator Ibrahim Gobir as Chairman and Senators Shehu Sani, Enyinnaya Abaribe, Danjuma Goje, Dino Melaye, Matthew Urhoghide & Gbenga Ashafa as members of the Ad-Hoc Committee to investigate the Special Intervention Fund. Senate President, Dr. Abubakar Bukola Saraki announced Senator Ali Ndume- Chairman, Establishment; Senator Tijanni Kaura- Chairman, Police; Senator Abu Ibrahim- Chairman, Labour and Productivity. Plenary is adjourned to Thursday, 8th November, 2018.